This is, of course, not the first time we have raised such concerns. 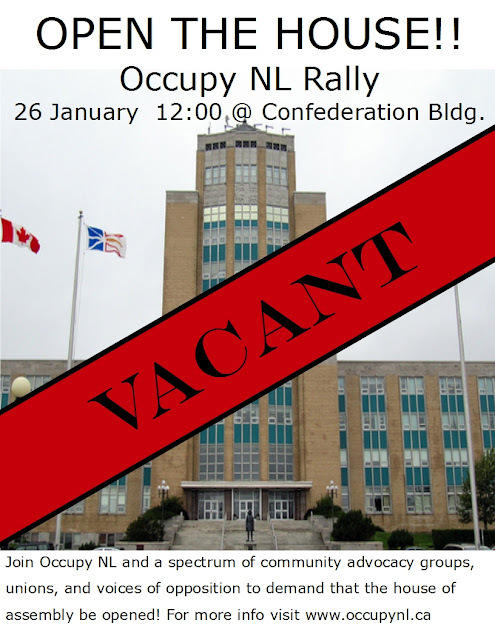 Last year, Occupy NL organized a similar rally with the very same message, but it seems that the provincial government still has not gotten the memo. Join us at Confederation Building on January 26th at noon to make sure the message gets through this time! Open the House part 1 (video, audio, and photos). The point that discussion should take place is enough. We all saw the "public forum" with dr. locke the other night and even he said discussion should take place. He's an economist, right? Seems like even the New Dawn Agreement isn't all understood by most people. big questions there too. Why should we preserve a dying industry like the fishery when there are other growing industries that we could support?